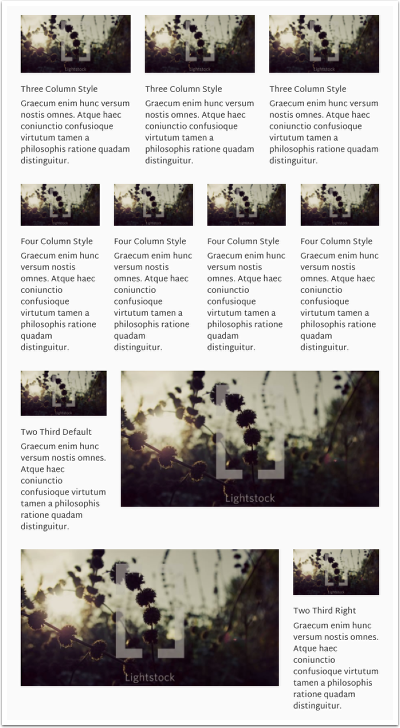 You can create a multi-column layout in the content area of pages and content sections by using custom classes and div tags. We have created a grid generator to make this process easier to use. Select the number of rows you want and then the column layout for each row (all columb options are seeing in the image above). This will produce a code snippet that you can place into the source code of your page. To place the snippet, copy the code snippet and go to your page/section/event/article/etc. in the CMS. You will need to use the sorce code view option (which looks like this in the too bar: < > ) and paste in the code to the desired location. Switch to edit view and you can update the example content as needed. The grid generator will place a dummy image and text as a placeholder so all you need to do us swap out the dummy content for your content. NOTE - Your style guide page has an example for review.